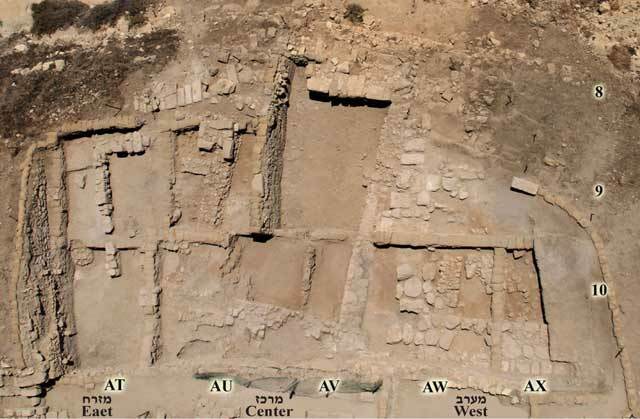 The twenty-ninth season of excavations at Tel Dor (License Nos. G-49/2010, G-62/2008; map ref. 1922–30/7246–60; Sharon et al. 2009 [2000, 2002, 2003 seasons]; Sharon, Gilboa and Karasik 2006 [2004 season]; Sharon, Gilboa and Shalev 2009 [2005 season]; Gilboa, Sharon and Shalev 2009 [2006 season]; Gilboa, Sharon and Shalev 2010 [2007, 2008 seasons], Gilboa, Sharon and Shalev 2011 [2009 season]) took place from late June to Early August 2010. The excavations were conducted on behalf of the Hebrew University of Jerusalem and the University of Haifa, in collaboration with the University of Washington, Seattle (a group headed by Sarah Culpepper Stroup), and the University of St. Joseph, Philadelphia (a group headed by Elizabeth Bloch-Smith). The excavations were carried out under the auspices of the Israel Exploration Society and were funded by the Berman Center for Biblical Archaeology, the Zinman Institute of Archaeology at the University of Haifa, The Goldhirsh-Yellin Foundation, California, the University of Washington and anonymous donors. Additional activities at the site were supported by the Israel Science Foundation and the White-Levy Program for Archaeological Publications. 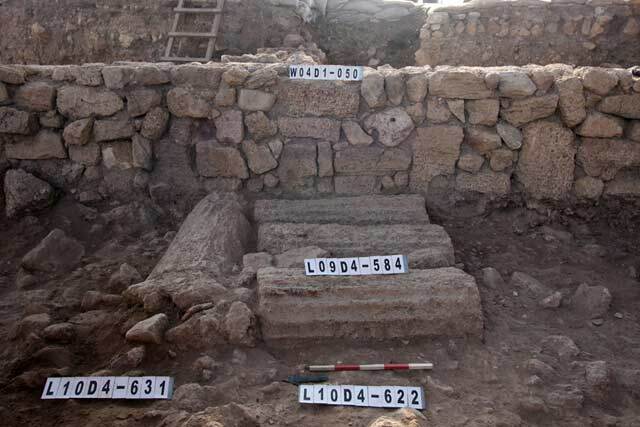 The excavations were directed by I. Sharon (Hebrew University) and A. Gilboa (University of Haifa), with the assistance of area supervisors—E. Bloch-Smith (Area D2), S.R. Martin, J. Nitschke and S. Culpepper-Stroup (Area D4) and B. Manning-Rozenblum and Y. Shalev (Area D5); unit supervisors—S. Madison and A. Goodstein (Area D2) and H. Sheedy-Burden, T. Layman, S. Moore, P. Thomas-Teigen and K. LeRoy-Vormstrand (Area D4); and recorders—K. Johnson (Area D2), T. Layman and M. Haase (Area D4), Y. Gekht (Area D5) and S. Firth (Assistant Recorder, Area D2). Also assisted S. Matskevich (field drawing and surveying), L. Brucker (photography), P. Barak and B. Monnickendam-Givon (registration and processing of finds), E. Boaretto (radiometric dating), L. Sapir-Han (archaeozoology), R. Linn and R. Shafir (Conservation), A. Bar-Hadas (administration), R. Shafir (pottery restoration) and V. Rosen and H. Kaftori (artifact drawing). The excavators were mostly overseas students and volunteers and students from the University of Haifa. Conservation was done with the aid of graduate students from the Faculty of Architecture at the Technion, Haifa, as part as a course in architectural conservation taught by R. Linn. The expedition lodged at Kefar Gallim Youth Village and was assisted by the staff of the Ha-Mizgaga Museum at Kibbutz Nahsolim and by members of the Kibbutz. The 2010 excavation season was conducted in the same three subareas in the southwestern part of the mound that excavated in previous seasons. Remains uncovered span the Iron Age I, Iron Age II, Persian, Hellenistic and Roman periods. The chronological terminology used below for the Iron Age is that employed in the tel Dor publications. Excavations in this area concentrated on three separate structures/areas. In the area’s northwestern strip of squares (AO/14–12) we continued to excavate the inner part of the so-called Bastion structure (Fig. 1). The Bastion wall is a massive wall founded on bedrock, running north–south and circumvallating the southwestern part of the area. In places, it is constructed of huge boulders. The southern part and mostly the outer, eastern face of this massive construction have already been unearthed in the past, by John Garstang, by Avner Raban and in Ephraim Stern’s excavations. Over the past several seasons, we have been excavating the northward continuation of this wall (W08D2-290), inter alia uncovering its inner face. This season it became clear that the wall starts to curve in its northernmost known part toward the west in a similar fashion to its long-known curve in the south (by the waterfront). It therefore seems that the area enclosed by the wall was oval or circular in shape. It also became clear that the Bastion Wall is pyramidal in section: narrow at the top, widening slightly as it goes down; a very peculiar construction. Different segments of the wall display differing building techniques. Some of the preserved segments of the western face of the wall are bedded in thick, clean, ‘organic-brown’ clay, and some portions of it were faced with small cobbles. 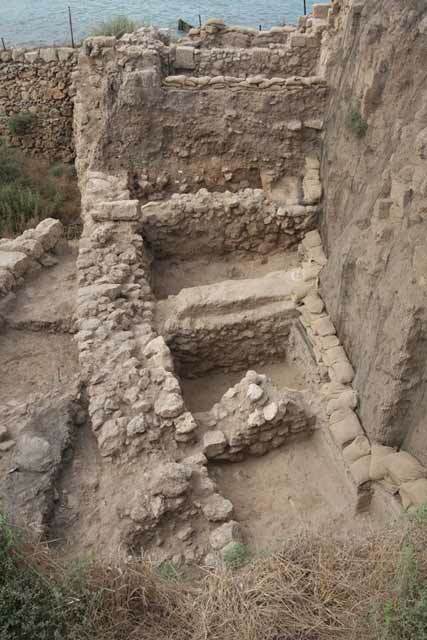 In a structure enclosed by this wall, which we began to excavate last seasons, we uncovered a row (aligned north–south) of four narrow rooms (1.3–1.6 m wide, length unknown), which abut the western face of the Bastion wall. Their walls have stone socles and mud-brick or pisée superstructures. The earliest deposits abutting these walls (and the Bastion Wall) were reached only in two spots. A surface in the southernmost room was rich in fish bones, including several distinct remains of articulated scales, vertebrae and fins, possibly the remains of complete fish. The pottery uncovered here was too scant to date this occupation phase. It probably dates to the early Iron Age, although several Late Bronze Age fragments may suggest an earlier date. Phase D2/13: Ir1a late. The overlying occupation phase within the Bastion was more extensively excavated and is better preserved, since it ended in a conflagration (Fig. 2). From south to north, the first room burned down, causing beams and bricks to collapse onto a floor devoid of remains. The second room also burnt, preserving parts of the collapsed ceiling with charred branches crisscrossing the room. Under the collapsed debris, in situ pottery was uncovered, comprising mostly store jars (carinated, commercial and oval) flasks decorated with red circles and other vessels. Clearly, this space was devoted to storage. In addition, beads, numerous fragments of glass, a gold object (bead? ), fish bones and much flint debitage were found here, as well as a large plank of burnt oak, possibly the remains of a shelf. Previous excavations in this room provided evidence of an upper floor that stood above this storage space. The third room had a layer (depth 0.2–0.4 m) of glycimeris shells, possibly the bedding for a floor. This room was neither burned, nor did it yield any contents. The excavation in the fourth room is still in the upper stages of the collapsed debris, with no signs of burning. It has yielded up to now fragments of large and small flasks decorated with red concentric circles, as well as flint artifacts: a core, a blade and debitage. From the pottery uncovered this season in the destruction debris, it is clear that this phase dates to the horizon termed at Dor Ir1a late. This fits the situation in all other excavation areas at Dor that reached the appropriate depth (Areas B, D5, G), where structures of this horizon was destroyed in a conflagration. In the area excavated in the past by Stern outside the Bastion, just east of the Bastion wall, the contemporaneous Ir1a late structure (Phase D2/13) also revealed signs of a violent end. 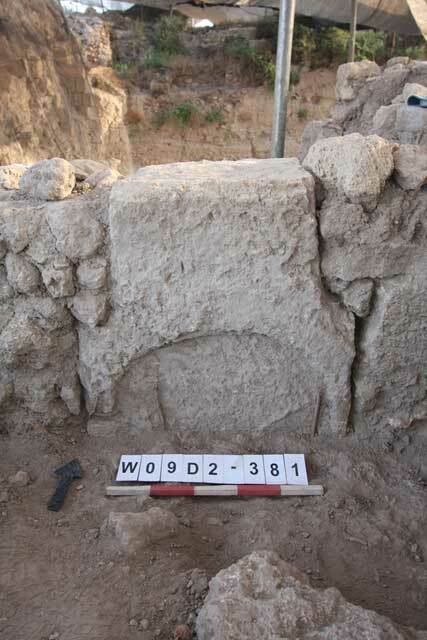 This latter structure, however, was about 2.5–3.0 m lower than the structure we are excavating inside the Bastion wall. This means that the area enclosed by the bastion wall was indeed an elevated acropolis of sorts. Based on ceramic—not stratigraphic—consideration, the destroyed phase within the Bastion wall is thus also termed Phase D2/13. It is clear that following the fiery destruction, some of the walls of the aforementioned rooms were still standing and activity was resumed above the destruction debris. In previous seasons, a small cultic installation was uncovered above the southernmost room. North of it there were mainly phytolith and ash surfaces that reached the walls and a trough-shaped installation or pit. Post-destruction accumulations were best preserved in the northernmost unit within the Bastion (AO/14). Not enough pottery has been uncovered to date this occupation accurately. It may either belongs to Ir1a late phase or is slightly later (Ir1a/b); in the latter case it would parallel Phase D2/12 outside the bastion, excavated by Stern. Phase D2/8: Ir1|2 and/or Ir2a. In Sqs AO–AN/14 we partially excavated two rooms in a structure situated outside the Bastion, abutting its wall from the east. The structure, dubbed ‘Benny’s House’, was first unearthed by Stern, who focused on one room that was partially excavated. In this room two main phases were defined, both of which ended in destruction: the lower one, Phase 8c, dates according to the Dor terminology to the Ir1|2 transition (elsewhere, this horizon has recently been called Early Iron Age IIA), and above it, Phase 8b, dates to Ir2a (elsewhere, Late Iron Age IIA). This season we started excavating the room west of the one excavated by Stern (a very small part of it was excavated by him as well). We uncovered the continuation of the north–south fieldstone wall separating the two rooms and two east–west fieldstone walls running from it westward to the Bastion wall. Again, two phases were identified. During the earlier phase this part of the structure comprised two rooms. Successive layers of dense, moist clay preserved organic material, such as a straw-filled bag(? ); phytoliths of grain husks and reeds, the latter forming a square surface; and bones, including those of an articulated puppy. In addition, the clay layers contained numerous restorable pottery vessels, mostly of domestic nature, including an unusual concentration of small goblets, the likes of which were uncovered here in Stern’s excavations. This phase also yielded a unique zoomorphic clay vessel in the shape of a horse and a Post-Rammeside seal depicting a figure holding a crocodile. During the later phase, there was apparently only one space in this part of the structure. It served for metallurgical activity, as indicated by ash, burnt sediments and other evidence of intensive burning, in addition to numerous copper/bronze slags, tuyères, a pot bellows, crucible fragments. Here too, crushed pottery was found in primary deposition on the surfaces. The stratigraphical correlation between these two phases and those determined in the past in the eastern room of the house is not entirely clear. It is also currently impossible to assign an exact date to the pottery, though both phases certainly fall within the range of Ir1|2 to Ir2a. Tentatively, the lower phase should be assigned to Phase 8b, and the upper one, with the metallurgical remains, to Phase 8a. For the time being, we also cannot rule out the possibility that the metallurgical activity post-dated ‘Benny’s house’ and thus constitutes an intermediate phase within Ir2a, between the structure and the overlying phase (D2/7). ‘Benny’s House’ is cut by the foundation trench of the massive ashlar wall uncovered here in previous years, which dates to Phase D2/7 (the so called ‘Taphat’s Palace’); the floors in ‘Benny’s House’ run under the wall. Sometime after the destruction of the Phase D2/8 house and before the construction of the Phase D2/7 ashlar structure, extensive parts of the Bastion Wall were robbed, and this massive wall went in effect out of use. In the two southwestern squares (AO/11–12), the excavation has not yet reached the early Iron Age levels as in the rest of the area, but late Iron Age deposits and the apparent top of an Iron Age wall were reached towards the end of the season. Phase D2/5(b? c?) (fifth century BCE, probably early in that century). 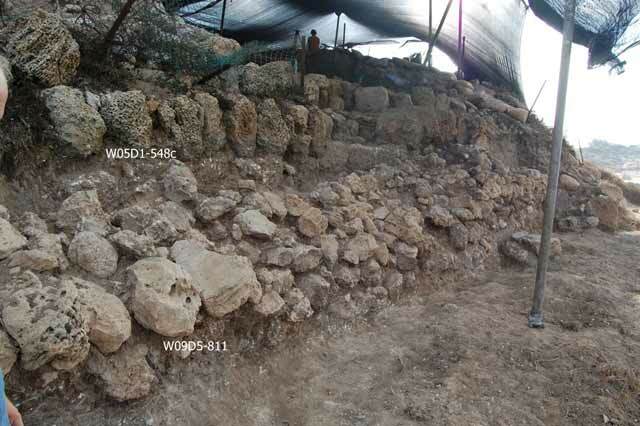 An east–west wall constructed in the Phoenician style comprising fieldstones and ashlars (W09D2-381) continued to be unearthed. It incorporated, in secondary use, a massive olive press bed (Fig. 3). This wall is part of the facade of a Persian-period insula, bordering on a street running to its south. Parts of the same facade wall and the insula itself have been excavated in more northerly squares, as well as in Stern’s excavations in D2, in units excavated to the east. South of the wall and cut by it, a floor/basin of sorts of unclear function was uncovered, constructed of an unidentified red matrix (a similar ‘floor’ was excavated above this one during the last season). These red surfaces seem to be the earliest Persian-period features in this unit, but the scant pottery associated with them, including Attic and so-called ‘East Greek’ fragments, does not allow for a better resolution than somewhere in the mid-sixth – late fifth centuries BCE time-span. This area is an extension of Stern’s Area D1. The excavation during this season (Fig. 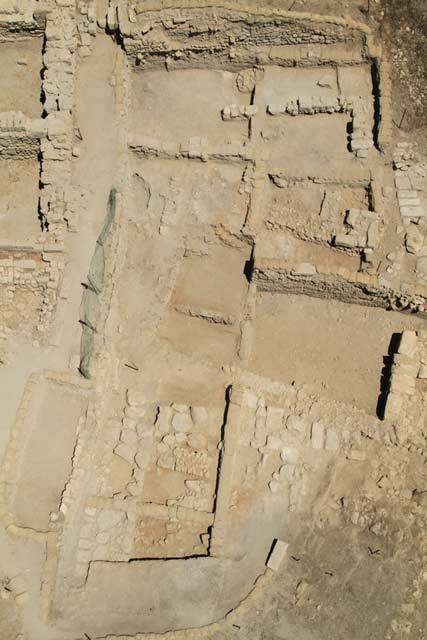 4) continued in most of the squares excavated last year, in addition to a few new units in the west. This is part of a long-term excavation and conservation policy, according to which the southern side of the tell will be dug gradually, from the crusader moat in the west to Garstang’s trench, east of Area D2, creating a theatre-like’ configuration, open toward the seafront in the south. Our short term goal is to expose what is possibly a courtyard house (Phase D2/9, probably of an Ir2a date), of which mainly the courtyard has been unearthed. The excavations in Area D5 have been divided into three subareas, each at a different level: The westernmost row of squares (AW–AX/10) yielded remains of the Ir2a to the Hellenistic periods; a lower, middle subarea (Sq AV/10) yielded a few Ir1a remains; and an eastern subarea (Sq AT–AU/9–10) revealed remains from the Ir2a to the Hellenistic period. Although the three subareas are in close proximity to each other, so far no direct connection between their features could be established. Therefore, they are discussed below separately. A reassessment of the local phasing of each of these subareas will be undertaken after the walls of the Iron II ‘courtyard building’ will be exposed. In the meantime, new insights have modified the previously suggested stratigraphical sequence of the area (Table 1). D5 West. Excavations in the western part of the Area D5 were held on two levels: an upper one (AW–AX/10) and a lower one (AW/09), which by the end of the season were brought down to the same elevation. 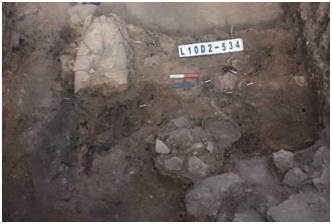 The remains of the later, mostly Hellenistic- and Persian-period features, exposed in previous seasons, were removed in order to unearth more of the Iron Age boulder-built building of Phase D5/8. Another goal was to lower the area down to the level of the ‘courtyard building’ wall of Phase D5/9 (for both buildings, see below). Phase D5/12: Ir1(?). Cleaning operations conducted along the lower part of the southern slope of the area revealed an east–west rubble wall (W09D5-811; Fig. 5), which is part of a long wall that was found in more easterly units as well. It runs the entire length of the southern slope of Area D5, about 5 m from the present waterfront, and continues further to the east—possibly a southern boundary wall of the city. As no feature reaching it from inside the city has been unearthed, the wall is difficult to date. It is certainly earlier than the ashlar city wall (Phase D5/9, Ir2a?) that runs above it. Currently, the most plausible attribution of this wall is to Phase D5/12, the earliest Iron Age occupation in Area D5 (established on bedrock), but this still requires corroboration. Phase D5/9(? ): Ir2a(?). One rubble wall (W10D5-918), apparently cut by the Phase D5/8 building (below), seems to belong to the Phase D5/9 ‘courtyard building’, possibly the back wall of the rooms west of the courtyard (below). A badly preserved pavement (W10D5-971) may have reached this wall form the west. Phase D5/8: Ir2b. Excavation in this area further exposed the two walls that create a corner of the massive, boulder-built building uncovered here in previous seasons (Fig. 6): the east–west wall, whose northern face was lined with large ashlars (W10D5-920), and the east–west wall (W10D5-960). The building, though very massive, was preserved only up to its foundation level. Only bits of plaster and kurkar floors—partially cut by robbers’ trenches and occasionally covered with patches of ash—, reach the walls, making it difficult to date the building. 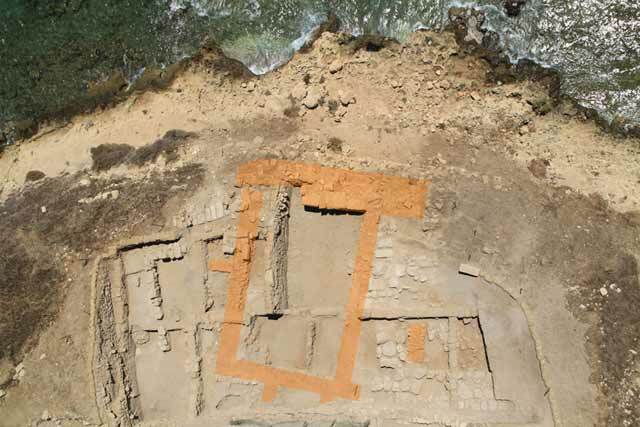 Following the previous season, we proposed a seventh-century BCE date for the building, but this season’s finds suggest that it is probably earlier. A Phase D5/7 pit (below) cutting through one of its floors contained pottery probably from the eighth century BCE, indicating that by then the building had already ceased to function. Its construction date, however, is still unclear. Phase D5/7, which may be divided into several sub-phases, consists of badly preserved walls; bits of floors, including shell floors; and two pits cutting the Phase D5/8 floors—indicating activities that took place here after the demise of the massive boulder-built building of Phase D5/8. One of the pits (L10D5-914) yielded complete vessels. The earliest material in the pits seems to dates to the eighth century BCE, but later features attributed to this phase date to the seventh century BCE. Later Remains. The Persian and Hellenistic periods (Phases D5/6–4) are represented by only a few pits in the newly opened squares in the western part of Area D5. D5 Middle. 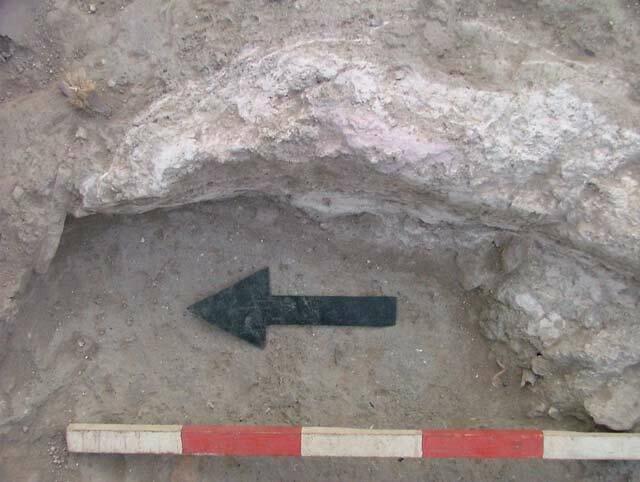 The excavation in this lower part of Area D5 was very limited, as it was concentrated in its northern part (Sq AV/10). The main objective was to expose the last remains of the Ir1a late destruction layer (Phase D5/11) that was excavated in the last seasons below the ‘courtyard house’. It became evident, however, that no significant remains of the destruction were preserved here, and the area was closed down. D5 East. As in the previous season, the main objective of the excavation here was to establish a better understanding of the Persian-period remains and, subsequently, to expose more of the underlying ‘courtyard house’ of Phase D5/9. Most of the effort in this area was concentrated in Sq AT/9, which is still higher than the squares around it; also excavated were Sqs AU–AT/10, AU/9 (Fig. 7). Phase D5/9: Ir2a(?). The only features apparently belonging to this phase are two stone walls (W5562, W5563), a segment of a pavement and a floor, all in Sq AU/9. These were already excavated during the 1990s, but their date and nature were not well understood then. By their orientation, level and construction method, it is quite obvious that they belong to the Phase D5/9 ‘courtyard house’ and comprise the eastern wall of the courtyard (W5562) and a wall of one of the surrounding rooms (W5563). The patch of floor must belong to the courtyard, and the pavement—to one of the rooms surrounding the courtyard. In conjunction with walls of this house excavated in the past in D5 Middle and during this season in D5 West, these walls provide the first clear outline of the ‘courtyard house’ (Fig. 8). The scant pottery found on the floors indicates a date in the Ir1/2–Ir2a range. Cleaning along the slope in Sq AU/8 also exposed parts of the Iron Age ashlar city wall (here named W5603), which, according to the excavation in Sq AV/8 (W05D1-548c there), seems to have functioned also as the southern wall of the ‘courtyard house’. However, here it seems that the fortification wall is stratigraphically earlier, and functioned only as the foundation for the southern wall of the courtyard structure (W05D1-548b-a). The relation between the ‘courtyard house’ and the different stages of the ashlar city wall here still requires a better definition. Phase D5/8–7: Ir2b. The only substantial feature assigned in D5 East to Phase D5/8 is a small segment of a massive wall in Sq AU/9, first excavated during the 1990s. It is constructed of large ashlars, with a core of rubble, above the aforementioned ‘courtyard building’ (W5554; see Fig. 8). Currently, it is impossible to know to which building it belongs, and its date can only be assessed to be within Iron Age II. Very plausibly, it is contemporaneous with the massive boulder-and-ashlar building in the western part of the area. To a later phase within Iron Age II (D5/7) belong some flimsy rubble walls (some of them are “Phoenician” ashlar-pier and rubble walls) and a floor in Sq AU/10, as well as a thick (3.5–10.0 cm) accumulations of phytoliths in Sq AT/10 (Fig. 9). The phyloliths, however, may in fact belong to Phase D5/8—a question which we hope to answer in the future. Generally, these features belong to the eighth–seventh centuries BCE, but their exact date and the correlation of these features to the sequence of Phases D5/8–7 in the eastern part of the area are not well established yet. Phase D5/6–5: Persian Period. The stratigraphical scheme presented here introduces some modifications of those proposed in previous seasons. Part of an apparently domestic structure has been excavated. Its walls exemplify different Phoenician construction styles: rubble sections alternating with large ashlar blocks; regular ashlar-pier and rubble; and one wall in the ‘interlocking ashlars’ method, possibly a re-used Iron Age wall. Phases D5/6c–6b mark the first Persian-period construction in this area, most plausibly following a substantial period of abandonment. Pits of these sub-phases yielded complete and near-complete vessels, mainly store vessels, such as Phoenician commercial jars, basket-handle jars and East-Greek amphorae from Chios and Thasos. Also found, among other things, were a zoomorphic vessel shaped as a duck’s head and a fragment of an Attic Red Figure vessel, possibly attributable to the Meidias painter of the late fifth century BCE. A few excavated pits belong to the subsequent Sub-Phases 6a–5c, and later walls belong to Sub-Phases 5b and 5a. Phase D5/4: Hellenistic Period. Excavation in D5 East was conducted mostly under the Hellenistic remains; the main excavated feature was the bottom part of a pit in Sq AT/10. In the eastern balk of the area, a wall belonging to the Hellenistic insula was further exposed (W16205). Its method of construction is unusual at Dor (Fig. 10). Whereas most of the wall was constructed in the ashlar-pier and fieldstone method common in Phoenicia, the rubble parts and the foundations were constructed of slanting, diagonally laid stones, so that the stones of each course slant in the opposite direction of the stones in the underlying course, thus creating a herringbone pattern. In addition, the remains of the two pits comprising the purple-dye installation excavated in the 1990s were cleaned down to their lime-lined floors. It seems that the southern pit was used as a dump for the exhausted shells (mostly uncovered in the 1990s), whereas the northern pit functioned as a sump for the disposal of the lime-water and other surplus liquids. It was still stained in places with vivid purple dye (Fig. 11). Work was resumed in the squares excavated last season (Sqs AN–AO/15–17) with an addition of one square (AP/15) which was last excavated in 2009. 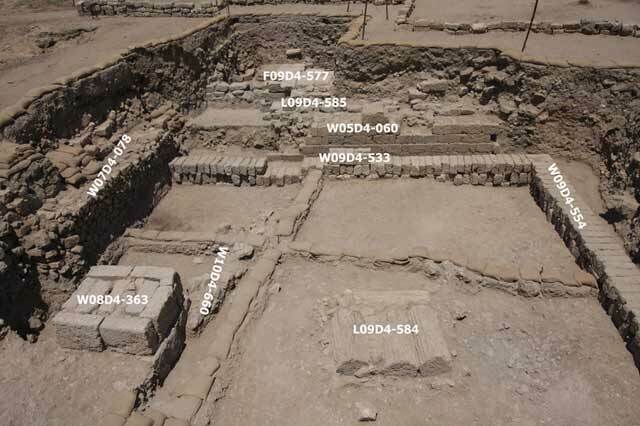 We focused mainly on the removal of the remaining structures associated with the Roman-period complex of Phases D4/1a–2b in order to further expose the large (palatial?) building of the Hellenistic period. Understanding this latter building is the main goal of the current excavations in D4. The removal of the Roman walls provided a better understanding of the architectural development within Phase 1 and, inter alia, uncovered two re-used fragments of plaster-coated fluted columns which must belong to one of the underlying Hellenistic structures. Phase D4/5. 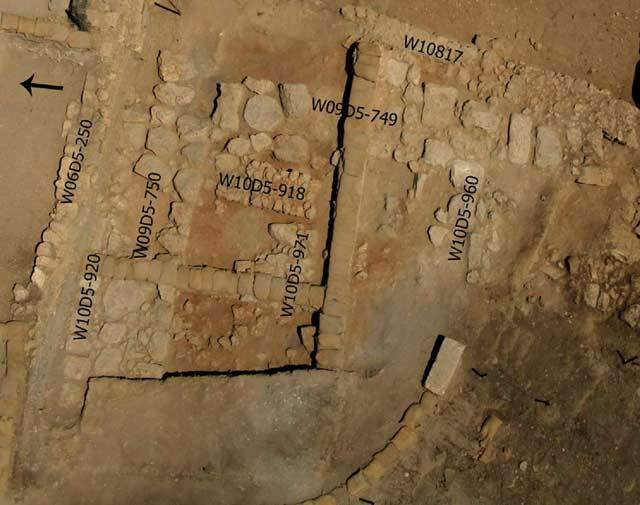 Only one portion of a rubble wall—apparently dating to the Hellenistic period—was uncovered to date under the architectural remains of Phases D4/4–3 (below). Phases D4/4–3: Hellenistic period. These two phases (Figs. 12, 13) comprise two distinct sets of walls, but the relation between them is unclear and at present there is not even direct stratigraphical evidence to indicate which set might be the earlier of the two or whether they might have been contemporaneous. These two complexes were dubbed the ‘Monumental Hellenistic Structure’ and the ‘Thin Ashlar-Walls Structure’. The ‘Monumental Hellenistic Structure’ is part of a very large Hellenistic complex in the southwestern part of the tell, one of the largest buildings of this period in the southern Levant. 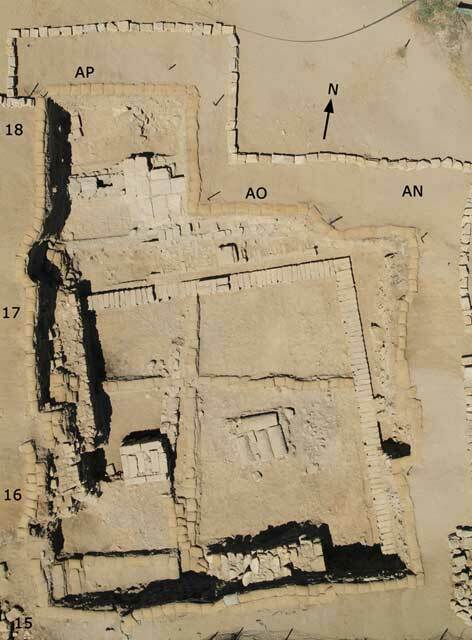 Its southwestern wing was excavated by Stern’s expedition and was erroneously assigned to the Persian period and dubbed ‘The Persian Palace’ (for the extant plan of this complex, see Stern, Berg, Gilboa and Sharon 1998: Fig. 77). The main wall of this structure in this area is an ashlar wall (W05D4-060b), built in the ‘compartment-building’ style. Two piers in the southern part of the area seem to belong with the ‘Monumental Hellenistic Structure’, but they perhaps remained in use also in the later ‘Thin Ashlar-Walls Structure’ (as suggested below). The western Pier is squarish, built of ashlars and preserved two courses high (W08D4-363); one of the stones bears a mason’s mark (a sigma). To its east is a square construction of approximately the same size, composed of four fluted kurkar column shafts lying horizontally, with some rubble in-between (W09D4-584; Fig. 14). The ‘Thin Ashlar-Walls Structure’ comprises two dovetailing walls of ashlar headers (W09D4-554, W09D4-553). The latter runs adjacent and nearly parallel to W05D4-060b; the gap between them is only c. 25 cm wide. Both walls have a regular external face, while the inner face in both is irregular, indicating that they were meant to be underground and not visible. Other than the further portions of W05D4-060b, no new features relating to Phases D4/4–3 were uncovered during this season. However, renewed analysis of the relationship between the two complexes may indicate that the stratigraphical scenario may have to be reversed. Originally, it was believed that the ‘Monumental Hellenistic Structure’, including the two piers, belongs to Phase D4/3, and that the walls identified as the ‘Thin Ashlar-Walls Structure’ are earlier, i.e. belong to Phase D4/4 (Sharon, Gilboa and Shalev 2011). Several considerations, however, indicate that these walls might be constructionally later than the wide wall of the ‘Monumental Structure’. This would fit the situation in the adjacent Areas, D1 and D2, where additional parts of these two architectural complexes were uncovered. It is quite possible that the thin header walls were constructed as a modification to the structure comprising the wide compartment walls, and that from a certain point on all the walls served together to form a double-wall foundation of a public building of some sort. Preliminary analysis of the pottery in the fills reaching all these walls point to a date in the third – first half of the second centuries BCE. Area D2. The high western balk in Area D2 was stabilized by draping a plasticized net over it and with sandbag buttresses built against the northeastern and eastern balks. The tops of the major walls in the area were covered with sandbags and overhanging walls in balks were supported by sandbag “constructions” as well. Area D5. As part of long-term restoration process, it was decided to construct a suitable drainage system for the lower part of the area (AV/9). Bordered from the south by the large Iron Age II fortification wall (W05D1-548c), which was built directly on bedrock, there is a tangible danger that the area will become a puddle during the winter. Therefore, the area was filled up to the level of the second course of W05D1-548c and a drainage pipe was driven through the southern balk, in the gap between W09D5-810 and W09D5-811. Area D1. Conservation work continued on the walls of the Hellenistic massive structure that was unearthed during Stern’s excavations. Gilboa A., Sharon I. and Shalev Y. 2009. Tel Dor – 2006. HA-ESI 121. Sharon I., Gilboa A. and Karasik A. 2006. Tel Dor – 2004. HA-ESI 118. Sharon I., Gilboa A. and Shalev Y. 2009. Tel Dor – 2005. HA-ESI 121. Sharon I., Gilboa A. and Shalev Y. 2010. Tel Dor, 2007, 2008. HA-ESI 122. Sharon I., Gilboa A. and Shalev Y. 2011. Tel Dor – 2009. HA-ESI 123. Sharon I., Gilboa A., Stewart A. and Bloch-Smith E. 2009. Tel Dor – 2000, 2002, 2003. HA-ESI 121. Stern E., Berg J., Gilboa A. and Sharon I. 1998. Tel Dor — 1995. ESI 18:37–40. 1. Area D2, Ir1a: The northern part of the Bastion wall (W08D2-290) and Phase D2/13 rooms abutting it, looking south. 2. Area D2, Ir1a: crushed pottery in the lower story of the Phase D2/13 building inside the bastion, looking east. 3. Area D2, Persian period: Phase 5 wall with re-used oil-press bed. 4. Area D5, arial view, looking south. 5. Area D5, early Iron Age rubble city or boundary wall (W09D5-811; Phase D5/12), looking north-east. 7. Area D5 East, general view of Iron Age and Persian-period walls, looking south. 8. Area D5, looking south. Extant walls of the ‘courtyard house’ of Phase D5/9 (in orange; Ir2a?) and the contemporaneous-ashlar city wall (in red). 9. Area D5 East, phytolith accumulations, probably belonging to Phase D5/7, marking a period of abandonment, looking west. 10. Area D5 East, Phase 4: W16205 (Hellenistic), looking east. The ‘empty’ space in the wall is a later pit that eliminated one of the wall’s ashlar piers. 11. 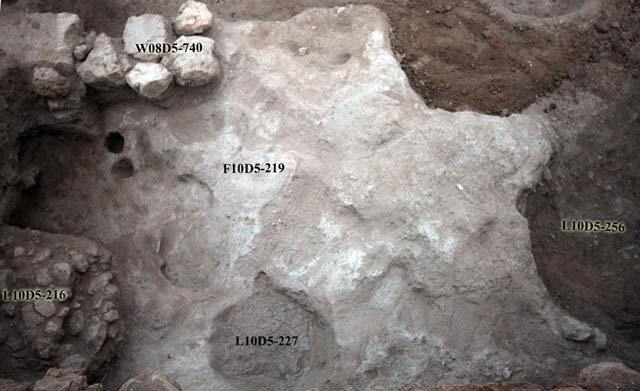 Area D5 East, Phase D5/4, plaster with purple stains in the northern pit of a Hellenistic purple-dye installation. 12. Area D4, aerial view of walls of Phases D4/4–3 (Hellenistic), looking north. The remains in AP/18 are of the Roman period. 13. Area D4, walls of Phases D4/4–3 (Hellenistic), looking north. 14. Area D4, Hellenistic pier constructed of fluted column shafts, looking east. Roman wall in the background. 15. 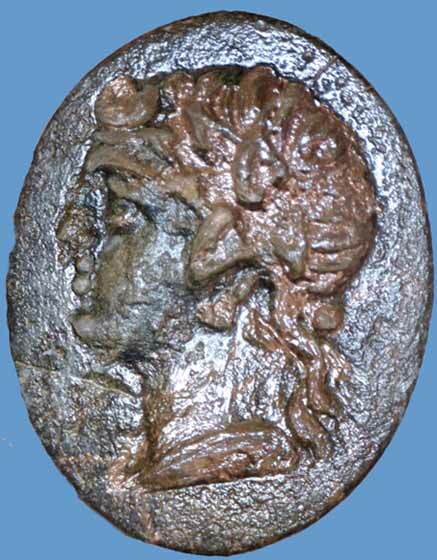 Hellenistic-period Bronze Bezel, probably depicting Apollo.